We offer removals services to Households & Companies moving Office . We are a local company for moving house in the UK or Overseas. As well as moving your furniture we offer a packing service or a supply of removal boxes for owner packing. Located to cover areas around Gatwick,Crawley,Horley,Horsham,Reigate,Redhill, East Grinstead, Oxted,Caterham,Dorking,Haywards Heath,Burgess Hill,Forest Row and Villages anywhere in the RH Postcode Surrey & West Sussex area. Barry & Robert proudly run B & E Removals and Storage. Trading since 1988 we have a reputation for quality,efficiency and reliability. From House Removals to Office Relocations, Local and Long Distance Removals in the UK or a Removal to Europe and Overseas we are experts in all aspects of Removals . With our packing services as well as our container storage, you can relax knowing that we can offer the complete package. We Can Be Trusted ! To see for yourself you can take a look at the comments made by our clients at Checkatrade. We hope you will be impressed but more importantly we hope that you will feel completely confident that we will make your move effortless. 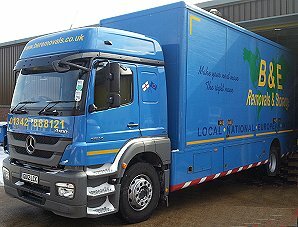 Ask for Barry or Robert at B & E Removals & Storage for a free no obligation quote today!